A Synopsis of Skin Diseases presents developments in the treatment and aetiology of diseases of the integument. It discusses the anatomy and physiology of dermatitis. It addresses the conditions that results from infections with viral diseases. 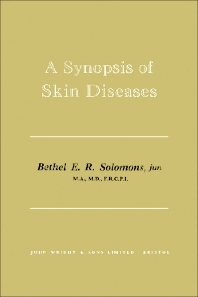 Some of the topics covered in the book are the monopolar electrodesiccation by fulguration; diathermy with cutting current or endothermy; description of skin treatments; aetiology of xeroderma; description of fish-skin disease; clinical diagnosis of congenital diseases; pathology of adenoma sebaceum; pathology of epidermolysis bullosa; and clinical features of chronic benign familial pemphigus. The lymphocytic infiltration of the skin is fully covered. An in-depth account of the diagnosis, symptoms, and treatment of lichen nitidus are provided. The diseases due to chemical and physical agents are completely presented. A chapter is devoted to the emotional factors in skin diseases. Another section is focus on the diagnosis of radio-dermatitis.